To be followed by a reception. Please register here. Professor Georgios Varouxakis will speak at Cambridge’s Global Intellectual History seminar on the 6th of November and the German Historical Institute in Paris’s Séminaire de recherche sur les Lumières on the 12th of November. Please follow the links above for more details. The School seeks to appoint a Lecturer in the History of Political Thought, specialising in the ‘long’ twentieth century. This appointment will join the international research cluster formed by the Centre for the Study of the History of Political Thought, a cross-faculty collaborative venture based in the School of History. The aim of the new appointment is to build on this strength by extending the cluster’s range of research and teaching. 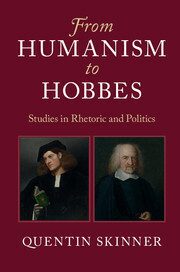 Currently, the historians of political thought in the School cover the early modern period, extending from the Renaissance to the eighteenth century to the twentieth century. By appointing in the twentieth century, the research cluster aims to strengthen further our expertise in the field of political ideas since 1890. The successful candidate will be expected to teach in the general history of political thought and intellectual history at undergraduate level, but to be able to supervise in the twentieth century at Masters and PhD level. Active participation in the activities of the Centre for the Study of the History of Political Thought will be expected. The University of London Institute in Paris (ULIP) and Queen Mary University of London (QMUL) are pleased to welcome Professor Georgios Varouxakis, Professor of the History of Political Thought at QMUL, for the first of the ULIP-QMUL Paris Lectures. Professor Varouxakis will be inaugurating this series by addressing the prominent role of the city of Paris in the shaping of the idea of ‘the West’. The lecture will first offer a brief genealogy of the idea of “the West” as a socio-political idea. The different uses of the term throughout its history will be analyzed and the contexts and reasons for its several metamorphoses will be scrutinized. The differences between the employment of “the West” in English and “l’Occident” in French will be focused on and the impact of French on English uses will be explored. Then the lecture will focus on the most explicit, thorough and systematic elaboration of a concrete idea of “the West” as a self-description (in preference to “Europe” or “Christendom”) and as a political project, in the mid-nineteenth century — with particular emphasis on the thought of the founder of Positivism and Sociology, Auguste Comte. Finally, the lecture will highlight the prominent role of the city of Paris in that story. We are pleased to announce the details of the keynote addresses for the 7th London Summer School in Intellectual History. The keynotes are open to all, but registration is essential. Opening Keynote Lecture: Tuesday 4th September, Professor Quentin Skinner (QMUL), ‘Interventions and ideologies: an approach to intellectual history’, register here. Closing Keynote Lecture: Friday 7th September, Professor Barbara Taylor (QMUL), ‘Philosophical Solitude’, register here. On Wednesday 16 May (16.30-18.30), Professor Georgios Varouxakis will be presenting a paper at the Université Paris 1-Panthéon-Sorbonne, titled « Comment faire la généalogie du concept politique d’Occident ? » as part of the series Séminaire d’histoire de la philosophie politique : « Pour une généalogie des concepts politiques ». For more details, please click here. Professor Varouxakis will also deliver an invited lecture at the conference on “Mill et la Révolution” at the Université Paris 1-Panthéon-Sorbonne, taking place on 25 and 26 May 2018. Professor Varouxakis’ lecture is titled ‘“The Revolution…is not English”: What did Mill think he learnt from observing France for half a century?’. The call for papers for the 9th Annual London Graduate Conference in the History of Political Thought has been announced. Please visit the postgraduate student website for more details. The deadline to apply for the 6th Annual London Summer School in Intellectual History has been extended to 28 July 2017. For more information on the summer school, fees, and required application materials, please follow this link. On the 3rd of July, Professor Quentin Skinner delivered the opening plenary address at the 6th Annual Conference of the Rhetoric Society of Europe, which was held at the University of East Anglia over the course of three days. Professor Skinner’s address was titled “Judicial rhetoric and cultural division: the case of The Merchant of Venice“, and an abstract of the opening plenary address may be found in the conference programme. On the 17th of May, Professor Quentin Skinner delivered the annual Avineri Lecture at the Hebrew University of Jerusalem. Professor Skinner’s lecture was titled ‘On the Person of the State’. This year also marks the 20th anniversary of Professor Skinner’s Liberty Before Liberalism. He delivered the keynote lecture on ‘Neo-Roman Liberty in the English Revolution’ at a conference in honour of this anniversary at the University of Amsterdam. The conference was entitled Freedom: Liberalism, Republicanism and Beyond: A Workshop in Honour of the 20th anniversary of Quentin Skinner’s Liberty Before Liberalism, and more information about the event can be found here. What is the future of the planet? Whether the impending ecological crisis, the movement of hegemonic ideological socio-political realms or the techno-scientific promises of life on mars, Planetary Futures engages a broad range of disciplines. This seminar series will generate dialogue across disciplines and we invite participation from all who have interest in the planetary, whether as a scale of inquiry or an object of study. The talks will be of interest to those in the social sciences, particularly Anthropology, Sociology, History, Politics, STS, Geography as well as the Sciences, particularly Physics, Astronomy, Geology and Space Science. The goal is also to spur a reflection among the broader interested public on the construction of planetary imaginaries and interrogate our current academic apparatus for thinking about planetary futures. Professor Georgios Varouxakis will give a Lecture at the Université Paul Valéry – Montpellier as part of the series of lectures on the theme “Philosophie européenne et le monde”. The lecture will take place on 11th of May 2017 and its title is “Les relations internationales selon John Stuart Mill et Auguste Comte”. For more details see, please click here. Since democracy is a creation of human culture, it must in some sense have been “invented”. This does not mean that the process of invention was deliberate. Instead it was a fortuitous product of human struggle. However, unlike many other political values and practices, democracy was not invented just once, but twice. This lecture is concerned with the relationship between these two moments, between the original formation of ancient democracy and its subsequent renaissance in modern history. Both events are shrouded in obscurity. First of all there is no record marking its first establishment in Athens. As a result, historians disagree about when it came into being. Then, secondly, the circumstances of its rebirth in the Enlightenment are no less complex, spawning controversy about when modern democracy began. One fundamental reason for the uncertainty is that the relationship between the ancient regime form and its modern re-incarnation has rarely been systematically explored. My argument is that a clearer understanding of what modern democracy took from its ancient predecessor can clarify how the modern version was brought into existence, and how it came in due course to be transformed. On the 26th of April, Professor Richard Bourke will be delivering a keynote lecture on ‘Popular Sovereignty in the History of Political Thought’ at the National Research University Higher School of Economics (HSE) in Moscow as part of the VIIIth Russian Congress of Political Philosophy on “The Modes of Thinking, the Ways of Speaking”. Professor Quentin Skinner appeared on the BBC World Service programme ‘The Forum’ to discuss Machiavelli and The Prince. To listen to the programme, please click here. For the first time, the sole surviving manuscripts of the most celebrated works of William Godwin (1756 – 1836) will be digitised and made freely available on the Shelley-Godwin Archive as part of a collaborative project announced today by Queen Mary University of London, the Victoria and Albert Museum, and Maryland Institute for Technology in the Humanities. Please click here for more information about this project. A public event will follow in September. Professor Quentin Skinner appeared on a BBC Radio 4 programme on ‘The Age of Consent’. To listen to the programme online, please follow this link. On the 24th of February, Professor Quentin Skinner participated in an interview at Oxford’s Ertegun House Seminar in the Humanities. The seminar is a termly series of conversations between members of the Ertegun House community and notable figures from the fields of culture, the arts, academia, journalism, and beyond. To watch Professor Skinner’s interview, please follow this link. Professor Richard Bourke visited Paris in February to give two talks. On the 2nd, Professor Bourke discussed ‘Burke, Revolution and Empire’ at L’Ecole des Hautes Etudes en Sciences Sociales. On the 21st, he participated in a discussion held in collaboration with University of London in Paris, the Queen Mary Centre for the Study of the History of Political Thought and Institut des Sciences Sociales du Politique, where he spoke on ‘Edmund Burke and the Origins of Conservatism’. Professor Quentin Skinner delivered a lecture at the inaugural conference of the Centre Européen des Études Republicaines (CEDRE) at the École Normale Supériore Paris on 24/25th November 2016. A shortened version of the lecture was published in Libération, 25th November 2016. To read the article, please follow this link. To coincide with the conference, the journal L’histoire published an interview with Quentin Skinner and Vincent Peillon (French Minister of Education until 2014) under the title ‘La république, avenir d’une longue histoire’ (L’histoire, November 2016, pp. 3-16). To access the interview, please click here (subscription required). Professor Georgios Varouxakis will speak at a round-table seminar on the teaching of the history of political ideas in Paris. The round table is part of the series of seminars of the Groupe de recherche sur l’histoire sociale des idées politiques, and will take place at the University of London Institute in Paris (ULIP) on Friday 2 December, 3.00-6.00pm. For more information please click here. Professor Quentin Skinner recently visited Stanford University, where he delivered the annual Harry Camp Memorial Lecture. The Harry Camp Memorial Fund was established in 1956 by friends and associates of the businessman and philanthropist Harry Camp. The fund brings outstanding speakers to the University for public lectures and promotes the study of “the concept of the dignity and worth of the individual”. Professor Skinner’s lecture, titled A Genealogy of Liberty, was delivered on the 27th of October. Please follow this link for the event page on the Stanford website. While at Stanford, Professor Skinner also gave a lecture to the Department of English on the 26th of October, and presented a paper to the Political Theory workshop on the 28th of October. Professor Georgios Varouxakis has been invited to deliver four lectures on the “Intellectual History of Modern Europe” at Fudan University, Shanghai, China. The lectures will take place on 7, 8, 10 and 11 November 2016. Professor Richard Bourke’s review essay, titled ‘Revising the Cambridge School: Republicanism Revisited’, on István Hont’s Politics in Commercial Society: Jean-Jacques Roussea and Adam Smith and Richard Tuck’s The Sleeping Sovereign: The Invention of Modern Democracy is now available on advance access from Political Theory. Please click here to access the essay (subscription required). Professor Quentin Skinner recently visited the Department of History of Stockholm University, delivering an open lecture (3rd October) and conducting a graduate seminar (4th October). He also delivered a lecture at the invitation of the Historical Institute, Uppsala University, on Wednesday 5th October. Professor Richard Bourke recently discussed Empire and Revolution: The Political Life of Edmund Burke in a New Books in Intellectual History podcast. To listen to the podcast, please click here. Professor Richard Bourke was jointly awarded the 2015 István Hont Book Prize for his Empire and Revolution: The Political Life of Edmund Burke. The prize is awarded by the University of St. Andrews Institute of Intellectual History for the best book published in intellectual history in any calendar year. For further details on the prize, please click here. The István Hont Book Prize is the most recent accolade for Empire and Revolution, which has also received an Honourable Mention for the 2016 PROSE Award in Biography and Autobiography (Association of American Publishers), and is considered to be among the Best Books of 2015 by publications such as the Irish Times, The Guardian and The Spectator. Professor Richard Bourke appears in the September issue of History Today. For his article on ‘Power and the People’, click here. Three recent publications by Professor Quentin Skinner are listed below. ‘O svobode respublik’, in Sovremennaya Respublikanskaya Teoriya Svobody, ed. Evgeny Roshchin (St Petersburg, 2016), pp. 25-42. ‘Hobbes and the social control of unsociability’ in The Oxford Handbook of Hobbes, ed. A. P. Martinich and Kinch Hoekstra (Oxford, 2016), pp. 430-48. ‘Shakespeare and the Legal World’ Counsel Magazine, June 2016, pp. 29-31. J. G. A. Pocock was awarded an honorary doctorate of letters in absentia by Queen Mary University of London on the 20th of July 2016. Please click on the link above to read his message on this occasion. Professor Richard Bourke appeared on BBC Radio 4’s In Our Time on the 30th of June 2016 alongside Melissa Lane (Princeton) and Tim Stanton (York) to discuss the idea of sovereignty. A link to a recording of the radio programme can be found on our ‘Resources’ page. For the interview in Persian, click here. On 13-15 June 2016, the Warburg Institute celebrated the 150th anniversary of the birth of Aby Warburg. Professor Quentin Skinner delivered a lecture titled ‘Hobbes’s Leviathan Frontispiece: Some New Observations’ at the conference commemorating the work and legacy of Aby Warburg. For recordings of the conference including Professor Skinner’s lecture, visit the website of the Warburg Institute. In the month of May, Professor Quentin Skinner visited the University of Toruń and Jagiellonian University in Poland to deliver two public lectures. His lecture in Toruń was also accompanied by the launch of Quentin Skinner: Historical Method and Republican Liberty. The volume contains Polish translations of some of his essays, as well as discussions by Polish scholars. Applications are welcome from doctoral students in intellectual history and related disciplines (the history of philosophy, literature, politics, and science) and from MA students intending to conduct future research in this area. The discussions will be led by members of staff from the different branches of the University of London and from overseas. In past years these have included Richard Bourke, Katrina Forrester, Gareth Stedman-Jones, and Georgios Varouxakis (QMUL), Hannah Dawson, Jeremy Jennings and Niall O’Flaherty (KCL), Michael Lobban and Lea Ypi (LSE), as well as Valentina Arena, Angus Gowland, Julian Hoppit, Axel Körner, and Avi Lifschitz (UCL). From outside the University of London, they have also included David Armitage (Harvard), Donald Winch and Iain McDaniel (Sussex), Richard Whatmore (St Andrews), Duncan Kelly (Cambridge), Felicity Green (Edinburgh) Iain Hampsher-Monk (Exeter), Martin van Gelderen (Göttingen), and Knud Haakonssen (Erfurt). To find out what students gained from their experience at the Summer School, please see the London Summer School in Intellectual History blog. Dates and fees: The event starts on 4 September 2017 in the evening and ends in the afternoon on 7 September 2017. It will take place at the UCL main campus in Bloomsbury. Participants are required to contribute £185, which covers tuition, lunches, and a reception on the first evening. In addition, those who would like accommodation in central London can book a room in one of the UCL Halls of Residence from £52.50 per night. How to apply: Please send a CV and a brief abstract of current or future research to Shiru Lim at: s.lim.10@ucl.ac.uk The deadline for applications has been extended to 28 July 2017. Professor Quentin Skinner delivered the J.H. Burns Memorial Lecture, titled ‘A Genealogy of Liberty’, on the 4th of May 2016. For a recording of the lecture, visit the website for the Institute of Intellectual History at the University of St. Andrews. In the month of April, Professor Quentin Skinner visited Washington and Lee University in Virginia, USA to deliver two public lectures. The first lecture, titled ‘How Should We Think About Freedom’, was part of the Mudd Center’s lecture series on ‘The Ethics of Citizenship’, while the second lecture, titled ‘Why Shylock Loses His Case: Judicial Rhetoric in The Merchant of Venice‘, was part of the university’s year-long celebration of the 400th anniversary of William Shakespeare’s death in April 1616. To watch a recording of the second lecture, please click here. Professor Quentin Skinner delivered the keynote lecture at Virgins, Wives, Mothers: National Personifications in Early Modern Europe, a conference held at the German Historical Institute Paris at the end of March. The keynote lecture was chaired by Thomas Kirchner (Paris) with commentary by Horst Bredekamp (Berlin), and titled ‘The Leviathan Frontispiece, Meaning and Provenance’. For H-Net’s review of the conference, click here. 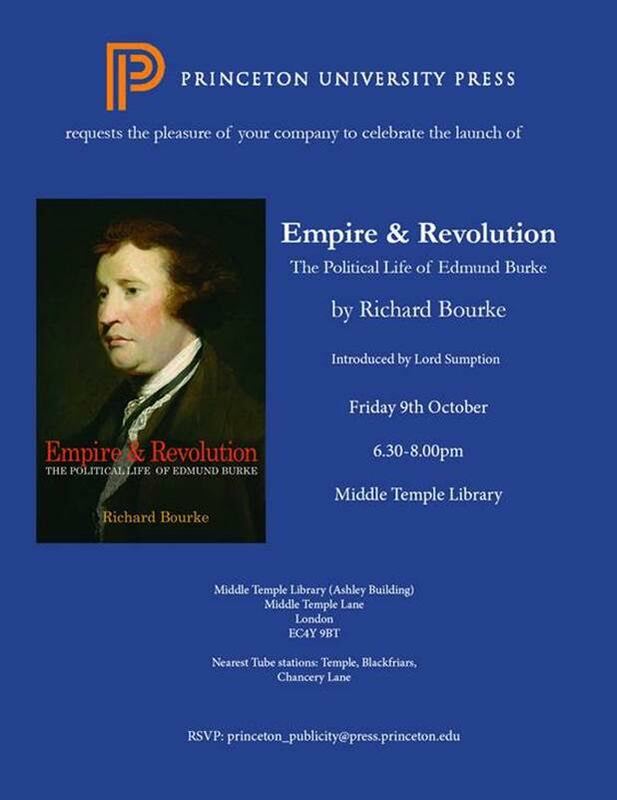 The launch of Prof. Richard Bourke’s new book, Empire and Revolution: The political life of Edmund Burke was held at Middle Temple Library on 9th October 2015, with an introduction by Lord Sumption. To view the poster for the event, click here. A symposium will be held on Thursday 10 September at Yale University on ‘Empire and Revolution: The Political Life of Edmund Burke’, a new book by Professor Richard Bourke. For details of papers and speakers, see the The Yale Center for the Study of Representative Institutions website. To view the poster (pdf) click here. The award of a Honorary Degree to Professor Pierre Rosanvallon of the Collège de France.